Manchester’s most welcoming creative arts organisation is for everyone who loves creative arts and crafts. Ancoats Visual Arts is a Manchester based creative arts organisation offering a range of community focused visual arts groups, classes and tailor-made projects. Our passion is our belief that the visual arts is a powerful transformative element in enabling people to make positive improvements in their health, well-being, self confidence and self-awareness, that creates positive personal and community change. Our Be Creative Studio sessions are a welcoming, friendly, inclusive and supportive arts club for everyone who enjoys arts and crafts. We welcome absolute-beginners – all you need is a passion to get involved. Our studio-based Art for Leisure courses can be booked-on-request by groups. Organisations can work in partnership with ourselves to plan bespoke School + Community arts projects around specific issues or events. “I have come to Ancoats Visual Arts almost every week. Working in a group with other artists challenges me to improve my drawing and painting skills. I benefit from sharing thoughts and ideas with like minded people in a friendly and informal atmosphere. Book as-and-when you wish to attend. 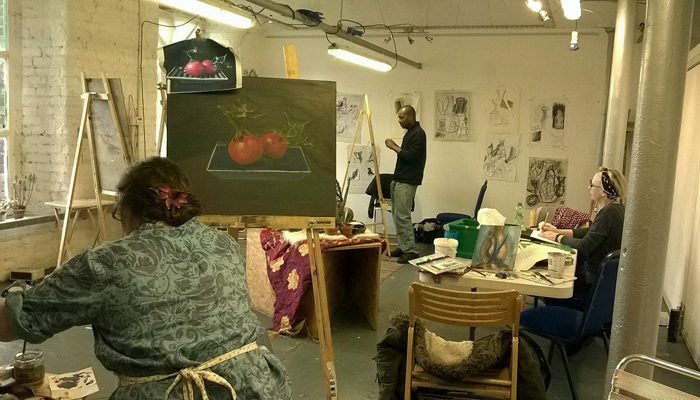 Be Creative studio-sessions are peer-supported sessions for drawing, painting or crafting in a supportive, relaxed and encouraging studio environment. Enjoy support from a friendly group of amateur-artists and see your enjoyment and confidence grow as you gain new ideas and learn new techniques. Make the Be Creative sessions a regular weekly event in your life. Every Be Creative studio-session is about enjoying a variety of arts and crafts – it’s up to you! We are happy to take suggestions from group members for different group projects and happier still if a member would like to take the lead for specific sessions. We understand everyone loves arts and crafts for different reasons. Most members join us for leisure, to find out more about arts and crafts, make new friends or improve their general well-being. This group allows you the freedom to develop in your own direction, at a leisurely pace that will ensure you maximise your enjoyment. The Art for Leisure courses consist of 2 artist-led classes where participants will enjoy teaching from an experienced community artist. Participants will also have the option to attend a free Be Creative studio-session to continue, to encourage them to start attending Ancoats Visual Arts on a regular basis and embrace creativity into their lives. Each Art for Leisure course will introduce participants to a new art or craft technique giving them plenty of time to relax, learn, experiment, and go home amazed at what they have created. Great for everyone – no previous experience needed. 2 x artist-led classes which are taught by an experienced community artist, with a relaxed atmosphere so everyone can learn at their own pace – no-one will be left behind as all levels of experience will be supported and encouraged. 1 optional peer-supported studio-session where you can continue your arts and crafts projects at your own pace. Tailor-made school + community projects are planned to meet the needs of your group and community. Our projects address a wide variety of community needs enabling people who do not usually access the creative arts to discover new talents, skills and creativity to encourage self-pride and a greater sense of well-being. Our School + Community arts projects encourage, nurture, teach and inspire. With over 25 years experience of working with Schools + Communities our projects enable everyone to access the visual arts, get involved, feel supported and be able to make startling discoveries that may lead to life-enhancing changes. We believe in conversation: working together to make things happen. From raising funds, to planning project ideas, to delivering outcomes that matter to individuals. the group aims to support members, and encourage the wider community, to embrace creativity and art into their lives. the group relies on much-valued, passionate + dedicated volunteers to lead peer-supported sessions. “Extremely informative and challenging. The textures exercise was particularly good fun. My name is Liam and me and my mum are really interested to join some local art classes. We found the Be creative classes by Ancoats in your centre. I saw that it requires 18+ members. I am 16, is there any possibility for me to join the class? Please call me to book for a class for my daughter &me. For 2 people she is 13 years.